Tacticool.com is a collective of firearms enthusiasts who celebrate the pro 2nd Amendment lifestyle. Most aftermarket sights come slightly oversized and have to be fit to the individual slide. One way of fitting the sights is to use a file to make the sites fit the slide. You do this by cutting the portion of the sights that fits into the dovetail. However, you must remember to check your work often. A little cutting can go a long way. If you over file and cut too much, your sight will be ruined and too loose in the dovetail. This person's quick fix was to epoxy the loose sight in place and hope that it would not move under recoil. While this seems like a good idea, things can go wrong and they did. As the fast curing epoxy dried it was still all over the dove tails, on the persons hand and smudged all over the slide. When we got the slide to fix it I just barely taped on the front sight and the epoxy gave way for the sight to fall out. The factory finish was discolored and the whole slide had to be abrasive blasted and refinished to make it look like brand new. 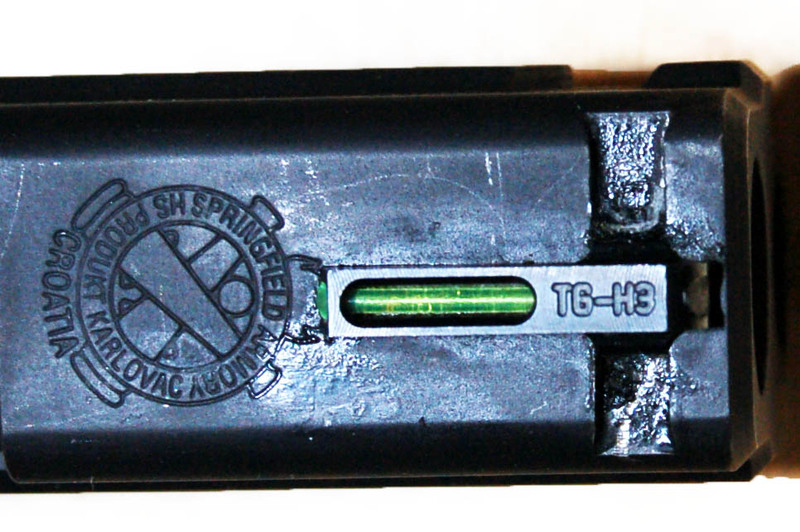 A new set of Truglo TFO's were installed and properly fit to the slide without any adhesives. If the epoxy were not enough, to make matters worse the rear dovetail was also damaged in the original install. Even after abrasive blasting and refinishing the damage was covered up and slightly hidden but could still be seen on closer inspection.